Hindu priests have begun a ritual to "find out the divine opinion" about inspection of priceless treasures unearthed from a temple in India. 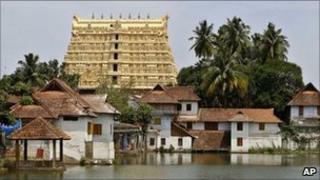 A panel of experts appointed by the Supreme Court is carrying out the inspection at the Sree Padmanabhaswamy temple in the southern state of Kerala. The temple vaults contained a huge collection of precious stones, gold and silver worth millions of dollars. Five of the vaults have been opened and the contents itemised. A sixth and more secure vault remains closed while officials determine how best to keep the items safe. Last week, a section of devotees protested when the experts began the inspection, saying that "god will become angry". The Hindu priests say they will begin a three-day-long "astrological ritual" to "discern the will of god or a deity" about the inspection. Descendants of the Travancore royal family, who look after the temple, wanted the ritual to be conducted before the sixth vault was opened. They said there was a "sign of a serpent" on the wall of the vault which "indicates that it is not auspicious to open it". The court has asked the experts to examine this claim. It is not clear whether the "astrological ritual" will bring the inspection to a halt. Atheists have protested the move saying it was an "affront to the court and one that defies logic". "The descendants of the royal family will submit the conclusions of the ritual to the court which is governed by India's secular laws. We have to know what the symbol on the temple vault means," historian MG Sashibhusan said. Local legend has long held that vast riches were interred in the walls and vaults of the temple by the Maharajas of Travancore over many years. Historians say it is almost impossible to assess the value of the objects, but officials have said it could be more than £12bn ($20bn). Neither the state of Kerala nor the descendants of the Travancore royal family have made any claim on the treasure, which they say is the property of the temple and its deity. But the discovery has sparked a public debate, with many believing the items should be put in museums or sold and the profits used for public good. Security has since been stepped up at the temple, which is now one of the richest in the world.